WE SUPPORT OUR TROOPS AND COUNTRY. Don Stivers' interest in art began during childhood as he copied newspaper comics in his hometown of Superior, Wisconsin. He did portraits of friends in school and during two years of service in the U. His formal art training began at what is now the California College of the Arts in Oakland. He started his professional career as have many of America's finest artists in the commercial art field, and spent 15 years at it on the West Coast until moving his family to the East. It was a decision that was to prove monumental in his career. Following a natural inclination towards American History as a subject for fine art, Don, in the 1970's, began a series of paintings on the Westward Expansion. In 1984 he began painting Civil War subjects. With the help of professional historians and driven by his own desire to know the most intricate visual details of the subjects he portrays, he has created some of the most remarkable military art of this century. His focus on the Buffalo Soldier, beginning with Tracking Victorio in 1988 shone light on a subject that had rarely been chronicled in military art before. His original works can be found on display at forts Belvoir, Drum, Wainwright, Benning, Hood, Meade, Leavenworth, Sill, Riley, Campbell, the Army War College, the Pentagon, and are the pride of many public museums and countless private collections of military and Western Art. In his leisure time, he enjoyed being a member of the Loudoun Sketch Club where he and his fellow painters would set up their easels and try and capture the beauty of the local Virginia countryside. The resulting sketches are a complete departure from his photorealistic style. He also created several equine sculptures when he couldn't get the exact pose he needed from photographs. These have been bronzed and his family hopes to be able to offer reproductions in the future. Don passed away on November 5, 2009 at the age of 83. "Proud to Serve" Don Stivers Numbered Limited Edition Signed Print. With hand-me-down equipment, and worn out horse-flesh, he rode and fought in places no one thought soldiers could ever go. 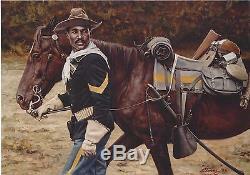 Buffalo Soldiers battled and defeated the Apaches, Kiowas, Commanches, Cheyenne, Mexicans and Mescateros. All Limited Edition prints are numbered and include a Certificate of Authenticity. Rare objects are more valuable. An Artists Proof (AP), generally, is the first 10% of the Limited Edition prints that come off the press. If the Limited Edition is 400 s/n, there would be 40 APs. This status is noted on the print. Collectors prefer APs because their value increases even more than a Limited Edition as time goes by. All Limited Edition artwork is subject to availability at time of order. The item "Proud to Serve Don Stivers Signed Limited Edition Print Buffalo Soldiers" is in sale since Thursday, May 28, 2015. This item is in the category "Art\Art Prints". The seller is "airplanesandmore" and is located in Flower Mound, Texas. This item can be shipped to United States, Canada, United Kingdom, Denmark, Romania, Slovakia, Bulgaria, Czech republic, Finland, Hungary, Latvia, Lithuania, Malta, Estonia, Australia, Greece, Portugal, Cyprus, Slovenia, Japan, Sweden, South Korea, Indonesia, Taiwan, South africa, Thailand, Belgium, France, Hong Kong, Ireland, Netherlands, Poland, Spain, Italy, Germany, Austria, Bahamas, Israel, Mexico, New Zealand, Singapore, Norway, Saudi arabia, Ukraine, United arab emirates, Qatar, Kuwait, Bahrain, Croatia, Malaysia, Chile, Colombia, Costa rica, Panama, Trinidad and tobago, Guatemala, Honduras, Jamaica, Barbados, Bangladesh, Bermuda, Brunei darussalam, Bolivia, Ecuador, Egypt, French guiana, Guernsey, Gibraltar, Guadeloupe, Iceland, Jersey, Jordan, Cambodia, Cayman islands, Liechtenstein, Sri lanka, Luxembourg, Monaco, Macao, Martinique, Maldives, Nicaragua, Oman, Peru, Pakistan, Paraguay, Reunion, Viet nam.